Surprisingly, most polymers are mutually insoluble. But that doesn't stop them from being mutually miscible across a boundary. For adhesive systems, the more they are miscible, the stronger the adhesion - an effect far more important than surface energy. The Helfand formula tells us about intermingling across the boundary. Play with the length, b, of each pseudo-monomer unit and with the Flory-Huggins χ parameter which indicates serious immiscibility when greater than 0.5. The calculation and the graphic show how well the two polymers are interacting across the interface. When two polymers meet at an interface, their chains can intermingle. The more they intermingle the greater the adhesion between them, increasingly linearly till the chains intermingle beyond the entanglement length and then adhesion becomes very strong. For polymers in solvents we can be quite relaxed about the χ parameter. 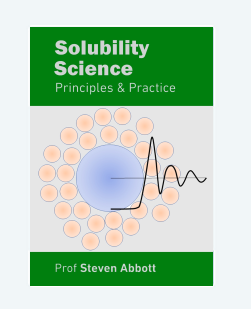 Even when it is as large as 0.5 (the theta solvent criterion) we still have adequate solubility. But for polymer-polymer interactions such "large" χ values are unwelcome. Indeed, for polymer-polymer miscibility, any χ greater than ~0.005 is a disaster. For intermingling we still welcome χ values less than 0.5 but the dependence isn't so critical. For those familiar with HSP the equivalent HSP Distance, D, is calculated as D²=4RTχ/100 where the 100 is a nominal molar volume of a monomer unit. Because entanglement is so important for strong adhesion, it would be useful if we could compare d to the entanglement length to indicate the onset of entanglement. Unfortunately, the entanglement length is known for relatively few polymers and it is somewhat unclear what it means for the two different polymers across an interface. But the general idea is sound: for strong interactions across an interface, a low χ is highly desirable.